Fitness celebrity Jack LaLanne was one of the first people to have his own exercise show on television. This was during the 1950s when it was considered eccentric for a man in his 30s and 40s to be concerned with fitness and health. Through the decades Jack LaLanne, usually clad in his trademark jumpsuit, maintained his persona as the older man still vigorous and energetic through exercise and healthy living. Fast forward to early 1990s. Here comes along Jay Kordich, calling himself “The Juiceman”. 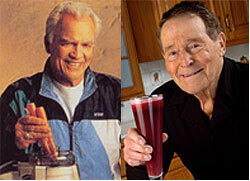 And the Juiceman pretty much adopts Jack LaLanne’s persona as the vigorous and eccentric older gentleman into fitness. Only this time the persona was used to market juicing machines on infomercials. In some ways Jay Kordich seemed even more LaLanne than Jack. Whereas Jack was energetic, the Juiceman seemed hyperactive. Whereas LaLanne came across as eccentric, Kordich often came across as downright strange. So how does Jack LaLanne respond? He decides to take The Juiceman’s marketing methods and sell his own brand of juicer and appear in his own infomercials to sell them. It’s a case of Jay taking from Jack and Jack taking from Jay! Someone must have known something was wrong with that first infomercial for the Jack LaLanne Power Juicer. A second infomercial was made, this one hosted by veteran infomercial hostess Forbes Riley, in which Jack appears with his wife Elaine. In this infomercial the old energetic Jack is back! The infomercial even concludes with Jack belting out his old TV theme song. Meanwhile, Jay Kordich hasn’t made an infomercial in years. The most recent version of the infomercial for The Juiceman Juicer doesn’t feature Jay Kordich at all. It appears, however, that Jay Kordich is still alive and plans on hosting several classes for the Learning Annex in 2007. Well Jay Kordich got into a legal dispute with the company making the juicers, and eventually he was forced to give up the name ‘Juiceman’ while the company continued to market his product. That’s why you see that infomercial for the ‘juiceman’ without Mr. Kordich … he hasn’t made a dime off the ‘Juiceman’ juicers in years. Jay’s planning a comeback though at the end on this year into 2007, and you should see him selling his juicers on HSN, and his new infomercial very soon. Jay Kordich not only takes Jim Carrey’s parody as a compliment, but also boasts about it in his website. (To me, it is mildly amusing though). Wow I lived growing up into health food in early 90s with jay! yay for jay! i used to have the juicelady. For many years on end, I thought “Juiceman Jay” was Jack LaLanne’s nickname. Until today. I have lived in the era of 2 JUICE GODS.